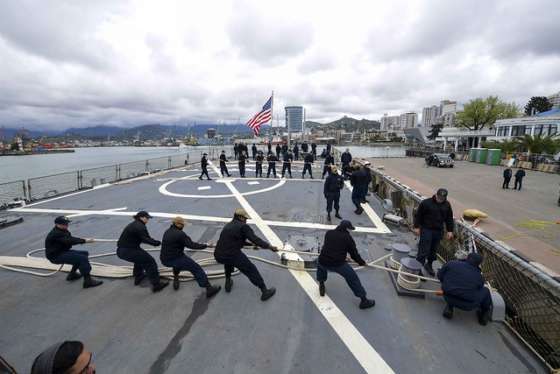 Federal employees who kept the ships running during the 35-day government shutdown have said they fear the most recent lapse will leave a permanent mark on them and their colleagues. Some excepted employees said they’re worried how the government shutdown would ultimately impact their future credit scores and finances. Many are concerned their colleagues, especially young or recent hires, are looking for other work. Others lamented the time it would take after the government shutdown to trudge through a backlog of work and meet unfilled hiring demands. But several excepted employees said the recent shutdown, the longest in U.S. history, ultimately soured their opinion of the government as both an institution and an employer. 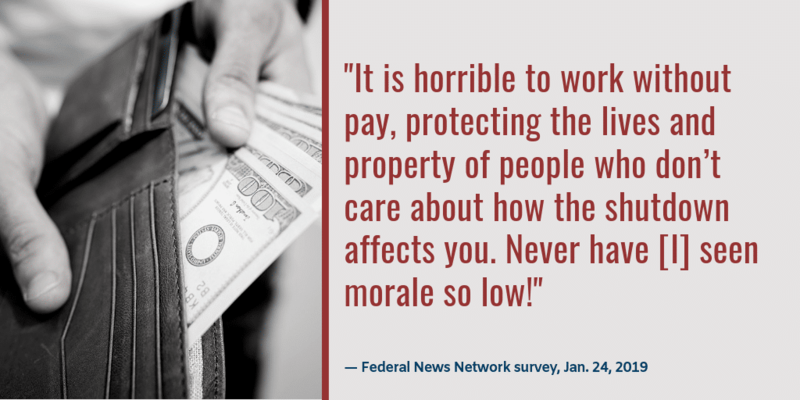 Nearly 90 percent of excepted employees who took an anonymous Federal News Network survey last week said morale at their agency was worse off now than it was before the government shutdown began in late December. A single person said morale at their agency had improved after the shutdown, and nearly 10 percent said it remained the same. 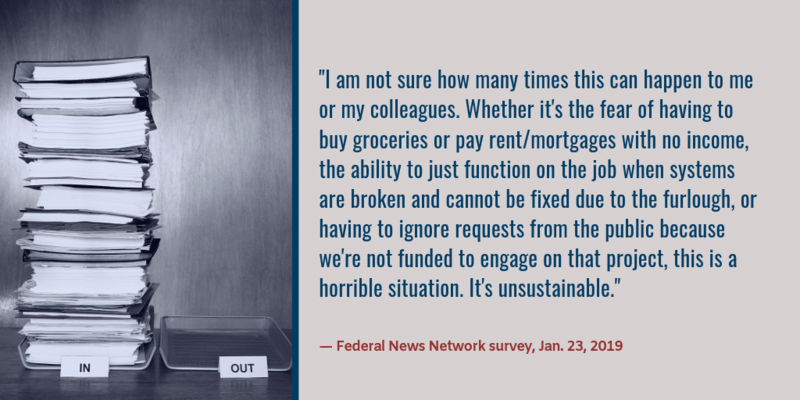 Federal News Network received responses from 1,013 furloughed employees, excepted workers and contractors. A little more than 400 people described themselves as “excepted employees” during the government shutdown. 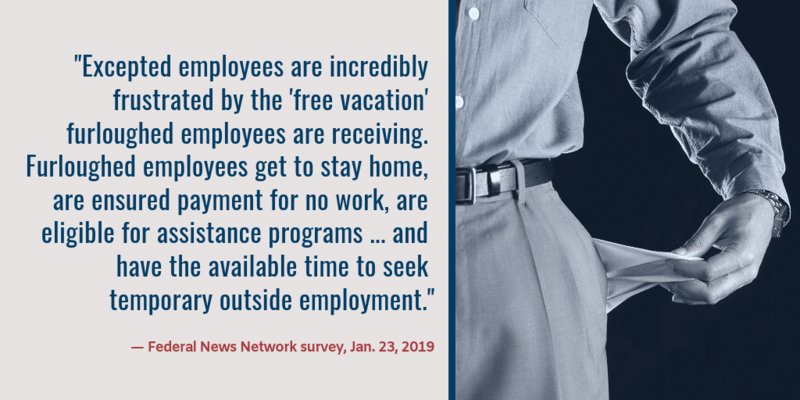 Many excepted employees said their morale in particular had taken a hit during the government shutdown knowing they specifically had been asked to come to work while their colleagues were furloughed at home. Excepted employees said it’s unfair everyone will eventually get paid, even though their furloughed colleagues spent the past 35 days at home. Excepted employees don’t have the time to drive for a ride-sharing app or apply to be a substitute teacher, respondents said. More than 81 percent of excepted respondents said their ability to pay for the basics during the recent government shutdown was their number one concern. Excepted employees said their conversations at work were consumed with financial concerns. Others said the sheer uncertainty of not knowing when they would get posed the biggest challenges. One excepted employee said the shutdown had thrown wedding plans into disarray. A few excepted employees said they had saved for this very scenario. Others said they would try to set aside extra funds in the event that a prolonged government shutdown happens again. Excepted employees expressed other frustrations about their time spent working during the government shutdown. 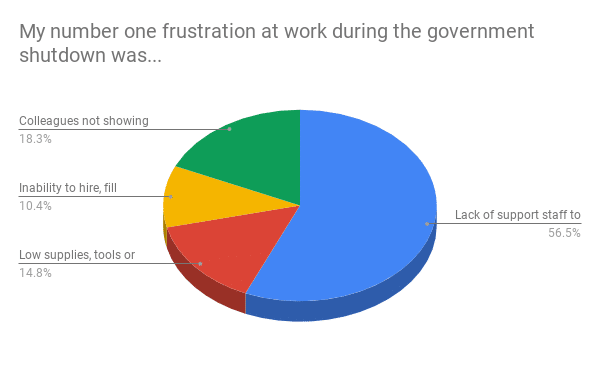 A majority said their number one challenge while working through the shutdown was the sheer lack of support staff to answer human resources, finance, budget and other questions. Lack of supplies, tools and training was the second most frustrating aspect of work life during the government shutdown. Many excepted employees expressed concern or stress over work that wasn’t getting done during the government shutdown. One respondent said his work unit had missed at least four in-depth reviews of air traffic facilities during the government shutdown. Others said they and a handful of colleagues were handling phone calls that typically require the time and attention of dozens of employees to address. And while 78 percent said recouping lost pay and benefits was their biggest concern after the shutdown ended, rebuilding employee engagement and morale came in a close second. Meanwhile, a handful of respondents said they were actively considering retirement or leaving altogether. 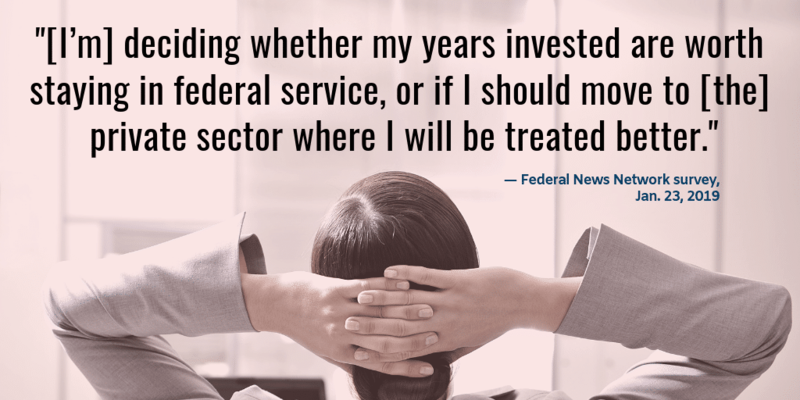 “[I’m] deciding whether my years invested are worth staying in federal service, or if I should move to [the] private sector where I will be treated better,” one employee said. Another respondent said his work partner would probably leave when the government shutdown ended.